Blog Home > Technical Documentation > Tech Docs: Traps Management Service Updates Are Live! Tech Docs: Traps Management Service Updates Are Live! 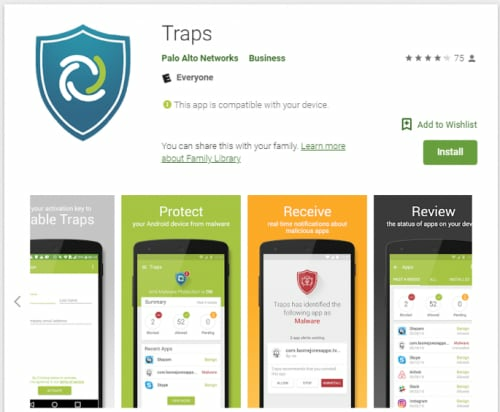 Traps for Android — You can now protect your Android endpoints from malware using the new Traps app for Android. To get your end users started with Traps for Android, you create a custom installation URL from the Traps management service and send it to your users. Your custom URL contains a distribution ID for your Traps management service tenant which ties the Android endpoint to your tenant. After you install Traps for Android, you can use the Traps management service to manage your Android endpoints and view details about the threats and events reported by your Android endpoints. Traps for Android is supported on Android 4.4 and later releases. File Analytics — The Traps management service now provides detailed file analytics for the files that attempt to run on Windows and Mac endpoints in your organization. Child Process Execution Criteria — You can now allow specific parent processes to launch child processes and optionally configure execution criteria based on command line parameters. Windows Security Center Registration — You can now customize the registration behavior for Traps and the Windows Security Center. Delete an Endpoint — This feature enables you to manually remove an endpoint from the Traps management service (Endpoints view) and returns its license to the license pool. do you offer traps also for private usage. We do not currently offer Traps for private use.